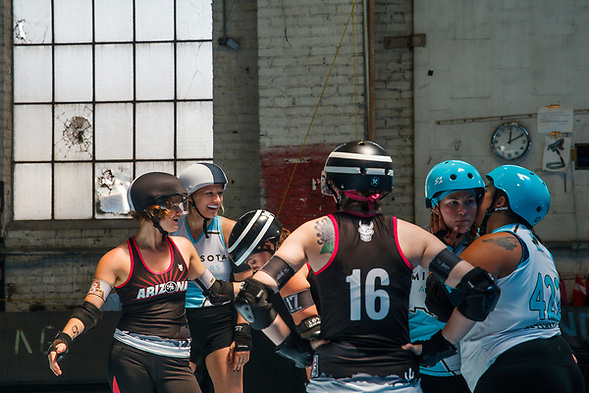 I first noticed the broken window panes two years earlier during the 2015 “United Nations of Derby,” when I took some of my favorite roller derby pictures in front of broken window panes. I like the pictures even more, because I photographed Eva Menace one of my favorite players. 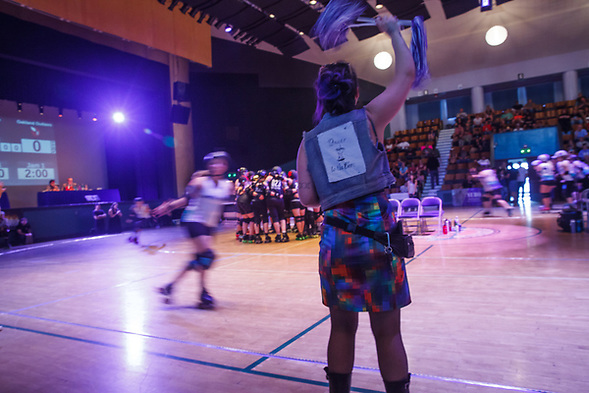 Whether we realize it, the roller derby community are descendents of the suffragettes. Father’s Day was on the third day of the Golden Bowl this year. 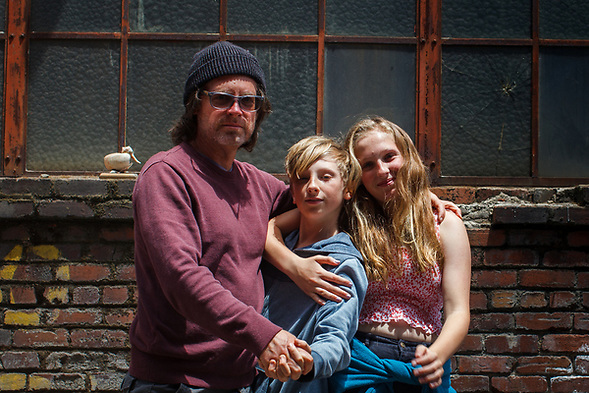 My kids and I visited Sunday morning so that we could take our annual portrait with the broken window pane in the background. Until this year, we have taken our Father’s Day photos in our backyard; we don’t have a backyard any more. We still have each other though. 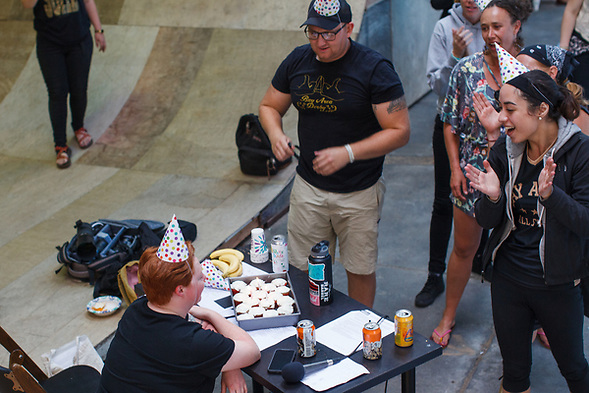 There were 17 bouts and at least two birthday celebrations during the three days of the Golden Bowl. Teams visited from Minnesota, Atlanta, Denver, Arizona and Santa Cruz. 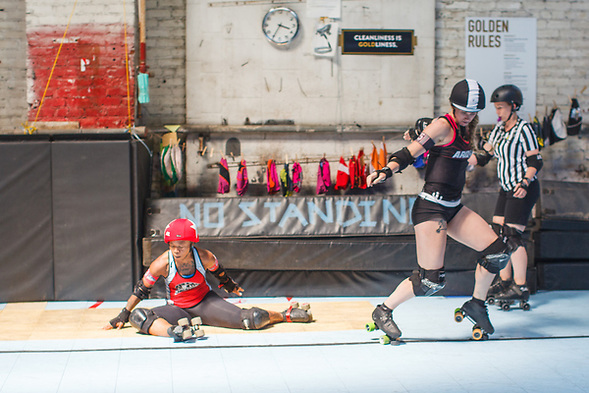 Two weeks after Golden Bowl, I photographed a ten year anniversary for the Santa Cruz Derby Girls. 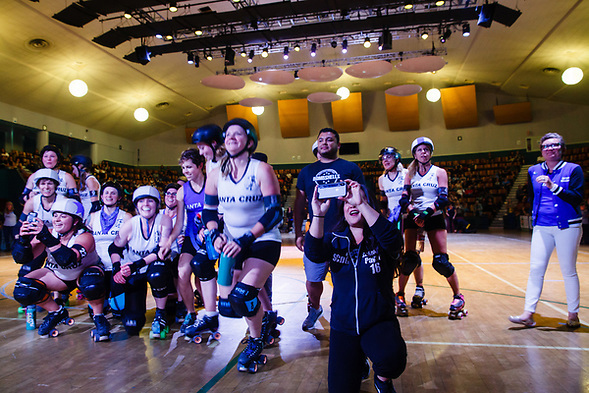 SCDG celebrated the Santa Cruz Battle of the Bays with Monterey Bay and Bay Area Derby. I argued with myself about photographing this event. I had planned an out of town trip to Riverside to celebrate my own anniversary. I was adopted 50 years ago on July 2nd, but I also wanted to go to Santa Cruz before driving south. When I arrived, I found the Santa Cruz SPCA. There was an adoption table. The dogs had little “adopt me” signs. 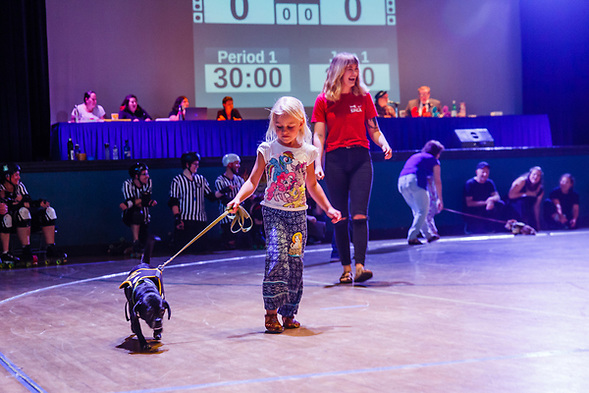 Between the two bouts, young people walked the dogs onto the playing surface. I thought that was going to be the highlight of the night. The second game was boring. Oakland scored the first four points before Santa Cruz outscored Oakland 158- 27. I was ready to leave until the announcers mentioned something about a vague halftime surprise. It was a proposal. 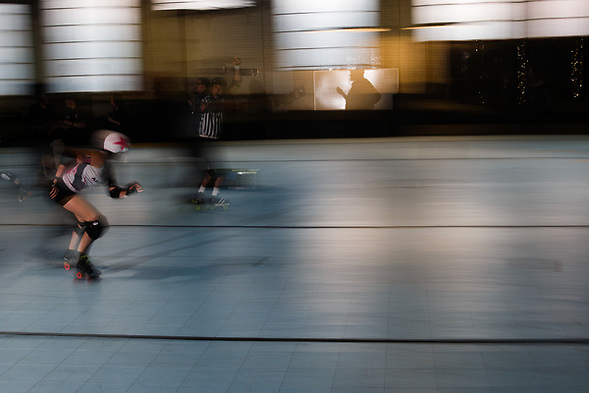 When people ask me why I continue photographing derby, I try to explain the sport and the rules. 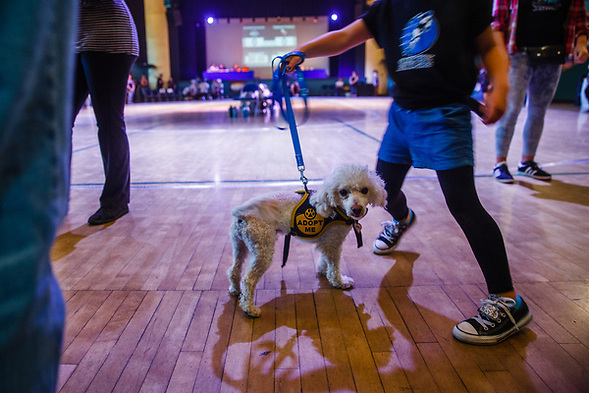 I brought a friend with me to Santa Cruz and she saw her first roller derby. I am glad that she saw the SPCA and the proposal. 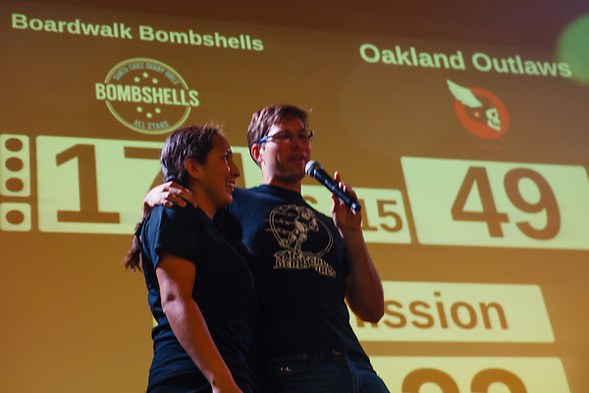 She did not see the excitement of a close bout, but the excitement of the proposal provided another argument for roller derby… and we can all use a good argument. Notes about this post and other ramblings can be viewed on my old More Than Kids blog. This entry was posted on Saturday, July 14th, 2018 at 9:58 pm. 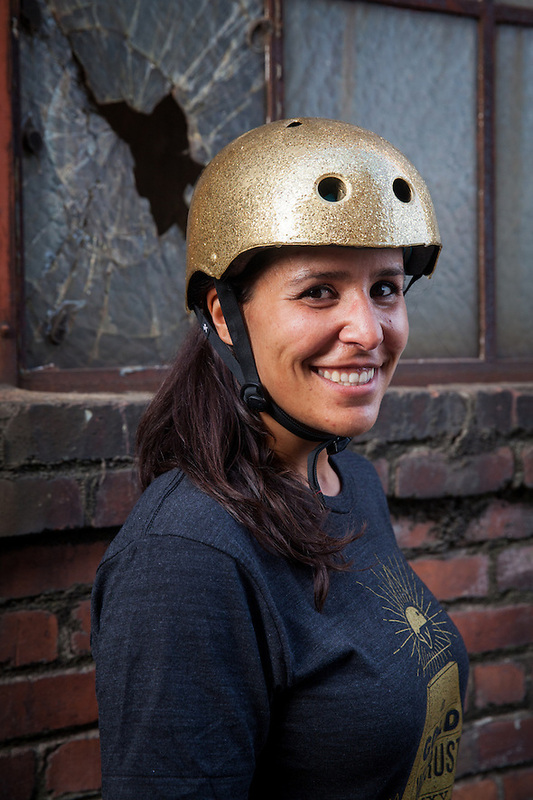 It is filed under Roller Derby and tagged with Bay Area Derby, Golden Bowl, Roller Derby, Santa Cruz. You can follow any responses to this entry through the RSS 2.0 feed.